INTERVIEW – The spokesperson for the supporters of degrowth, this engineer campaigns to give society an ecological and humane meaning. 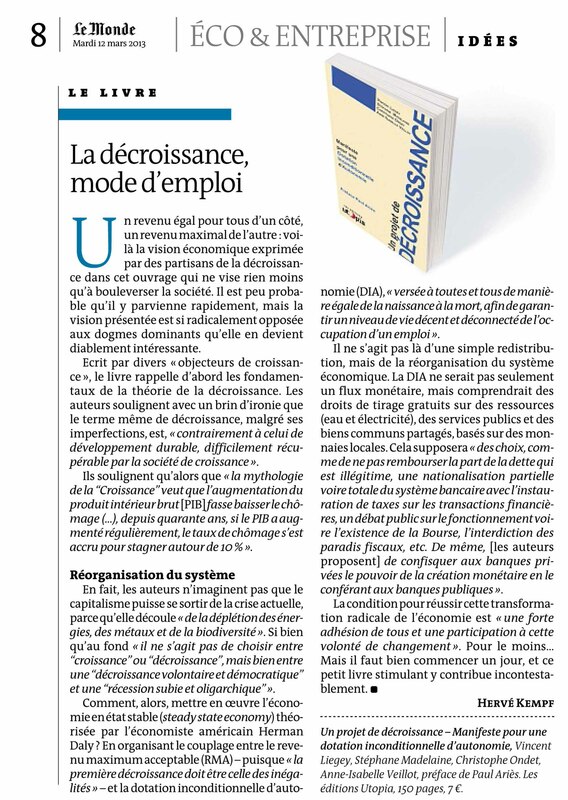 Whilst France is desperately seeking a pathway to growth, Vincent Liegey, co-author of the book: A Degrowth Project (Un Projet de décroissance – Utopia 2013) proposes alternative pathways to get out of the crisis. To advocate for degrowth whilst unemployment is exploding, isn’t it indecent? Growth does not guarantee full employment, it’s a myth: for the last forty years, the GDP has increased but so has unemployment. Imposing austerity plans with damaging human consequences and hoping for a return to growth oblivious of the ecological collapse is rather irresponsible. We cannot grow infinitely in a finite world. The word Degrowth is scary…. It is a provocative word to trigger an in-depth debate. What are we producing? How? Why? Growth forces us to produce more useless things by depleting resources. How can we get out of it by inventing a society valuing humane relationships, a different relation to tools, production, and nature? What is happening in Latin America around “buen vivir” (Well-Living) interests us. It is certainly not a return to candlelight. The first of all degrowths must be degrowth in inequalities. In reality, how can we do it? First we must abandon the cult of the economy. We must re-appropriate money creation, not pay back the illegitimate part of the debt, nationalise part or all of the financial sector, ban fiscal paradises and tax financial transactions. Implement as well a Maximum Acceptable Income at around four times the minimum income, which today is at a ratio of 1 to 4 000. Simultaneously we propose the Unconditional Autonomy Allowance (UAA) allowing everyone to enjoy a decent and frugal life, from birth to death. It is not a minimum income paid in euros, but a non-monetary allowance. Housing for all is possible in our well-off societies. The same goes for the redistribution of agricultural lands or a re-appropriation of real estate to set up production- recycling- repair workshops. Some resources must be free, to cover basic needs. The UAA could be issued in usage rights. At the beginning of the month, the gas or water meter could be credited with a certain amount of cubic meters democratically determined according to reasonable, local consumption criteria. We also advocate for free rights to public services: education, health, transport, news, etc. Are property rights under threat? Doing so often leads to authoritarian regimes, but we are opting for a democratic transition. The stakes are to open a debate to reframe this right when it infringes on common sense and some human rights. It will take time and political courage. But the actual system is no longer bearable. To evict people, when they can no longer pay their mortgage because of austerity plans, is an extreme form of violence. Some kind of eco-fascism driving people into misery. Against this barbary, this enforced austerity imposed by the oligarchy, we propose a democratic degrowth by choice. 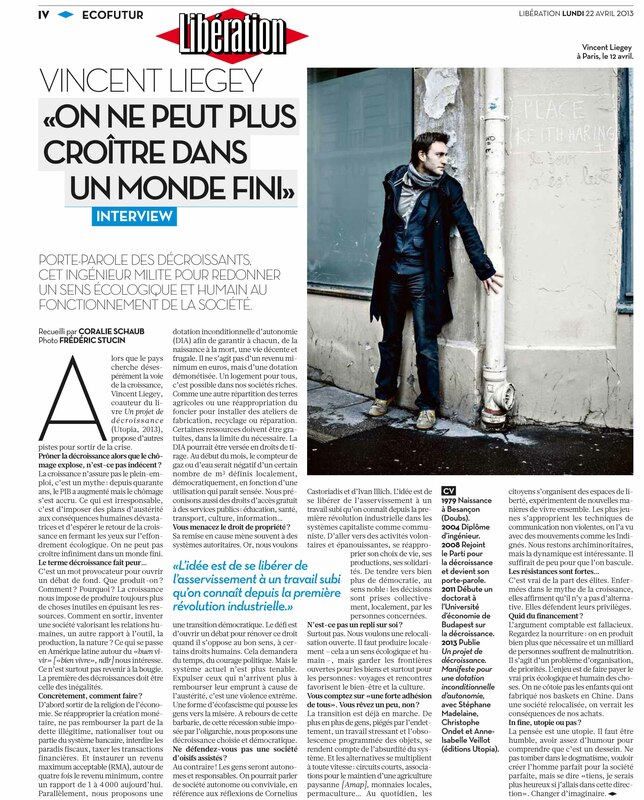 Vincent Liegey, spokesperson for Degrowth supporters and co-author of a Degrowth Project, Manifesto for an Unconditional Autonomy Allowance (Un Projet de Décroissance: Manifeste pour une Dotation Inconditionnelle d’Automonie) in Paris , April 12 2013 (Photo:Frédéric Stucin). Aren’t you advocating for a society of idle, welfare-assisted people? Quite the contrary! People will be autonomous and responsible. We could talk of an autonomous or convivial society, along the lines of Cornelius Castoriadis and Ivan Illich. The point is to free people from the subservience to work, as we have known it since the first industrial revolution, both within capitalist and communist regimes. To tend towards voluntary and fulfilling activities, to re-appropriate ones’ life choice, productions and solidarities. To lean towards greater democracy, in its noble sense: local, collective decision-making by the persons concerned. Isn’t it an inward turn? Not at all. We want an open re-localisation. We must produce locally – it has an ecological and humane dimension – but also keep borders open for goods and, mainly, for people: travels and encounters contribute to wellbeing and culture. You are hoping for “a strong endorsement from all”. Aren’t you dreaming a bit? Transition is already on its way. More and more people, entrapped in debt, a stressful job and planned obsolescence realise that the system is absurd. And alternatives are multiplying at great speed: direct trade, Network of Associations for the Preservation of Agriculture Smallholdings, transition movement… On a daily basis, citizens are setting up free expression spaces and experiment with new ways of living together. The younger people use non-violent communications means, as we have seen with the Indignados movement (The Outraged). We are a hyper minority, but the dynamic is interesting. It would not take much to tilt the balance. It is true for the elites imprisoned in the myth of Growth, they ascertain that there is no alternative. They are defending their privileges. The accounting argument is fallacious. Take a look at food: we are producing far more than necessary and a billion people are malnourished. It is a matter of organisation and priorities. We need to get people to pay for the real ecological and humane price of goods. We do not live alongside the children who have made our “Made in China” baskets. In a re-localised society, we would see the consequences of our purchases. In the end: a utopia or not? Thinking is a utopia. We must be humble, have enough humour, understand that it is a goal. Not falling into dogmatism, wanting to create the perfect man for a perfect society, but to say to oneself: “See, I could be happier if I chose that direction”. Creating a new imaginary. 2011: Starts a PhD on Degrowth at Budapest University of Economics. 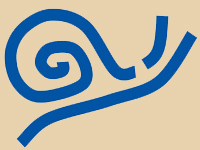 2013: co-author with Stéphane Madelaine, Christophe Ondet et Anne-Isabelle Veillot, Degrowth Project, Manifesto for an Unconditional Autonomy Allowance, Éditions Utopia, 2013.